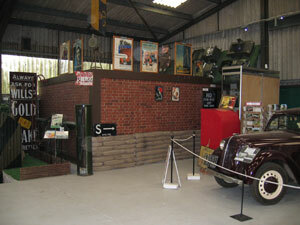 On entering The History on Wheels Museum Gallery Number One, you see on your right alongside the fully reconstructed Anderson Air Raid Shelter and across from the roof suspended diving V.1. Rocket, a large ‘brick built Home Guard/ ARP Building’ The ‘sand bag protection’ to the lower section is surmounted by various original WW2 ARP Posters etc which flank the Museum’s mascot, a fully uniformed Home Guard Sergeant ‘anamatronic’ figure waving a welcoming Union Flag. On sliding open the ‘blast proof’ door, you enter into the MUSEUM CINEMA. The intention of creating a MUSEUM CINEMA, was the initial step in attempting to avoid falling into the trap that so many other vehicle Museum’s/Display’s have fallen in to. Usually due to the enthusiasm of the Museum/Display organizer, many fine displays of ‘period’ vehicles are lined up in rows, just how the specialist collector/enthusiast would wish to see them. However, most members of the general public are not collector/enthusiasts, but do have in most cases a sentimental / curiosity interest. On viewing rows of specialist vehicles, many members of the general public could not be blamed for likening the rows of vehicles to a rather interesting, but, possibly boring ‘car park’. The History on Wheels Museum commissioned the making of a half hour film, illustrating a selection of the Military Vehicles currently on display in the Museum, ‘in action’. Together with, original period black & white film, and contemporary photographs, of the identical vehicles in service in the 1930’s & 1940’s. This we believe helps to bring a ‘dead’ vehicle back to life, and helps to inspire the interest, imagination and understanding of the Museum visitor. The companion commentary running throughout the film is personally carried out by Tony Oliver, and is intentionally intended to be not at all ‘technical’, but interesting, easy to listen to, easy to understand, and, hopefully, entertaining. Although the making of the Military Vehicles film proved to be very much more costly & time consuming than first anticipated, the final end product we feel made it all worth while. The intention now is to make a similar film illustrating and demonstrating a selection of the civilian vehicles taken from those on display in the Museum. Rather than build a boring ‘nondescript box-room’ to house the Cinema, the ‘Home Guard / ARP Cinema Building’ was created, to include all interior dressing, from the Air Raid Warden in the front seats, to the wall coat rack complete with cinema patrons uniform jackets, gas masks & steel helmets. 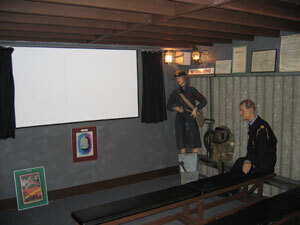 The walls are adorned with all manner of original WW2 Posters, photographs, Hitler shooting gallery, and even the Cinema Projector is housed in, and projects through, the ‘Eton Wick Home Guard Red Cross Cabinet’. All of which we hope will combine to adding to an authentic WW2 period atmosphere for the Museum visitor entering the MUSEUM CINEMA.